An arrest warrant for a third Irishman is being sought by Brazilian police in their investigation into the alleged illegal sale of Olympic tickets. Detectives said they want to question Martin Burke, the sports director of the Olympic Council of Ireland (OCI). Two other Irishmen, Pat Hickey and Kevin Mallon, are facing charges as a result of the investigation which began as the Games opened in Rio last month. Both men, who were arrested, imprisoned and released on bail, deny wrongdoing. Mr Hickey, 71, was the most senior Olympic official in Ireland before his dramatic arrest in a Rio hotel room on 17 August. He has since temporarily stepped aside from his roles as OCI president, president of the European Olympic Committee and his post in the International Olympic Committee (IOC) while the investigation continues. An OCI spokeswoman told the BBC the organisation was "aware of press reports" that Brazilian police were now seeking a warrant for Mr Burke's arrest. "The OCI has not been contacted by the Rio authorities with regard to Mr Burke nor indeed has Mr Burke been contacted by the authorities," she said. "Mr Burke returned to Ireland from the Rio Games with the Irish Olympic team." The BBC is seeking a response from Mr Burke to the police statement. On Thursday, Brazilian police said they also wanted to speak to the president of the International Olympic Committee (IOC), Thomas Bach, but were treating him as a witness, not a suspect. It followed the discovery of emails from Mr Bach to Mr Hickey. Who's who in Irish Olympic tickets controversy? Police alleged that the IOC president received personal requests from Mr Hickey for hundreds of high-value tickets for the Olympics opening ceremony, the 100m final and the football final. 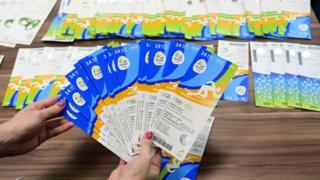 They added that Mr Hickey received 296 tickets after his written request to the IOC president. Mr Bach cancelled a planned appearance in Rio this week at the opening of the Paralympic Games, for personal reasons. On Tuesday, a Brazilian state prosecutor, said he had decided to charge Mr Hickey and nine others with ticket touting, conspiracy and ambush marketing. Mr Mallon is facing the same charges and both men had their passports confiscated until the investigation is complete. The eight other suspects are businessmen who are not in Brazil.